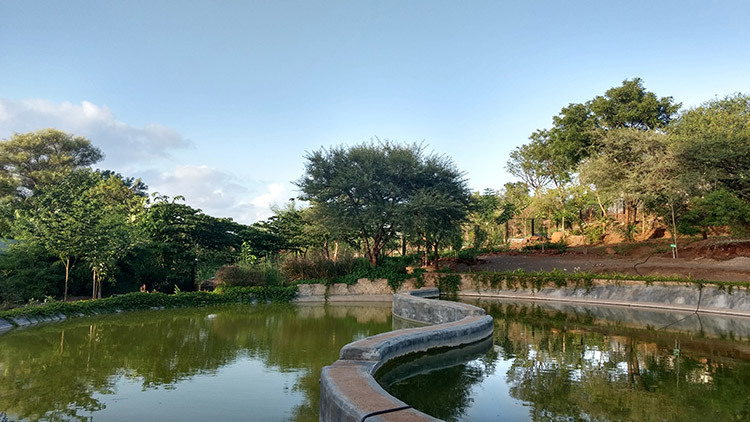 An example of a successful social initiative where some people from a housing society came together to ‘ecologically green’ a parcel of land in their visual backyard. 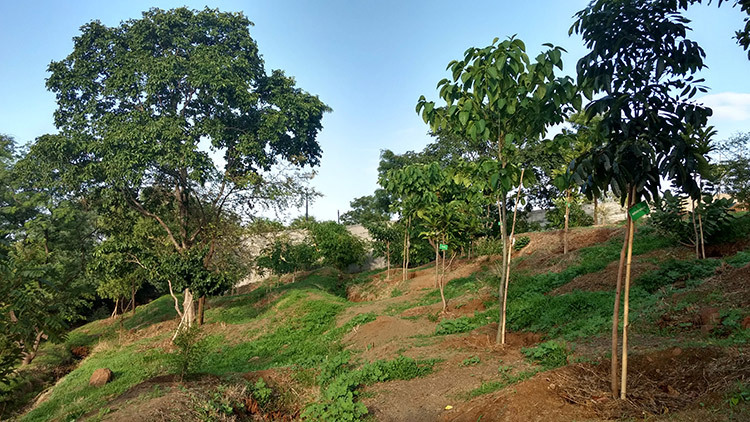 Though a part of a much larger part of Taljai Hill area in Pune ,this is a small parcel of land around 8 acres in area. A naturally sloping terrain with a few trees scattered across, this land was devoid of large shade giving trees and vegetation. The basic design brief was to afforest this land. After visiting the site, it was felt that a lot more could be achieved there with very minimum intervention. 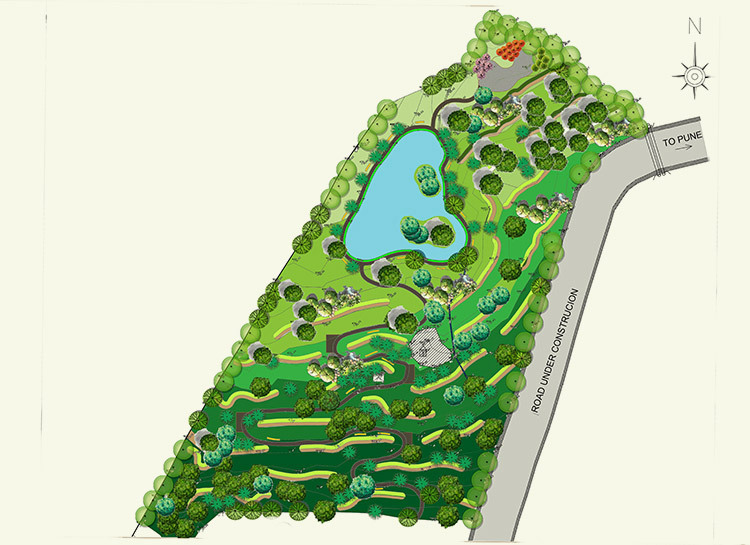 The brief was hence expanded to accommodate a natural path, an eco pond at the lowermost level and vegetation. Firstly we identified places for contour trenching. 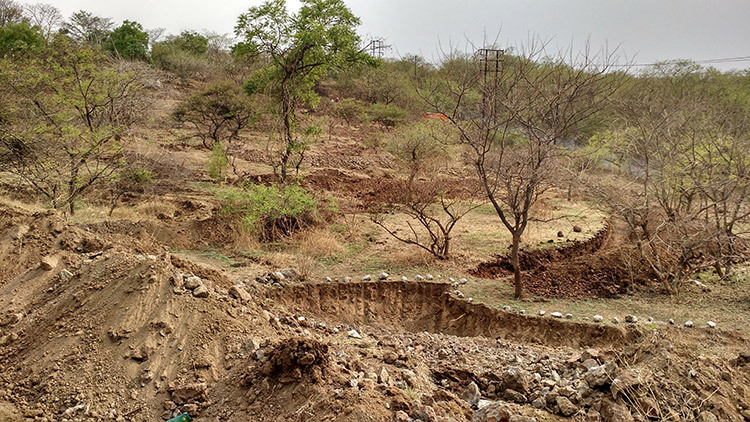 Trenches were dug and the soil stacked on the downhill side just before the onset of monsoon. The locations for the larger trees were identified and kept ready. 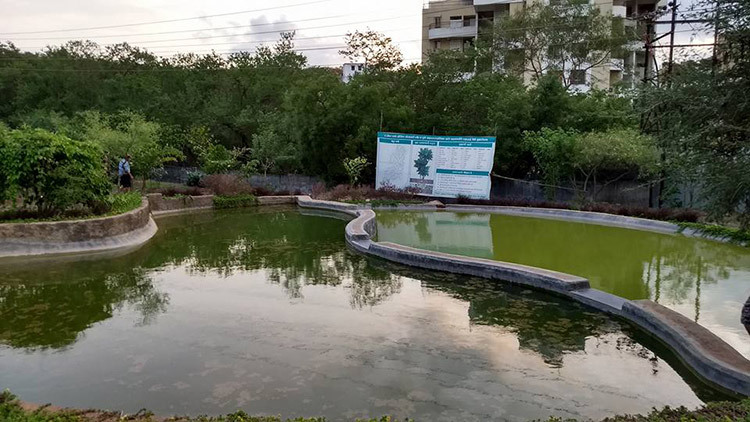 An eco pond was dug out at site in the lowermost flatter area. 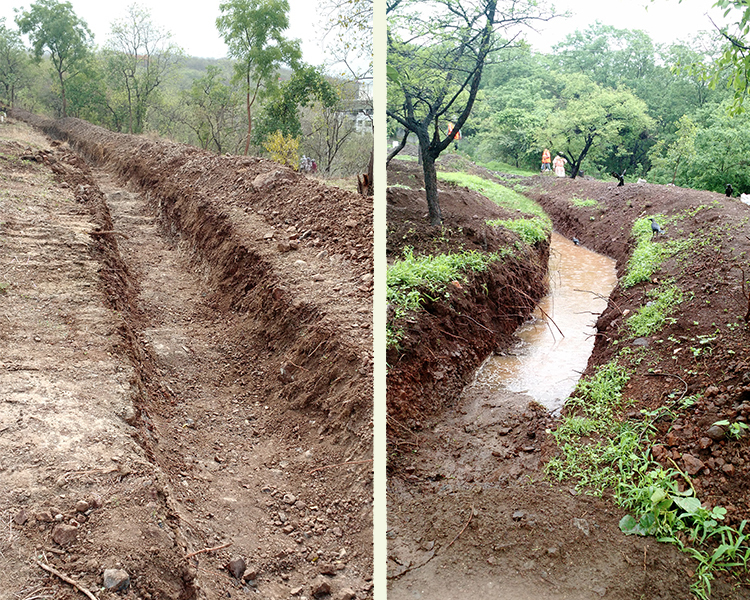 Once it started raining , all the trenches and tree pits started filling up with water and arrested the runoff. Soil was thus prevented from flowing down with the runoff. It also helped in building up the much needed moisture content in the soil. Once sufficient water was allowed to percolate, the trees were planted. 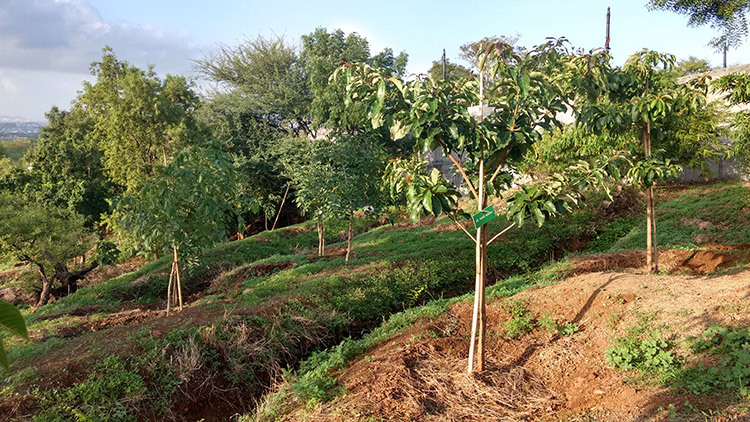 Indigenous trees of many varieties with medicinal properties were procured from many nurseries. The ecopond also filled up eventually. 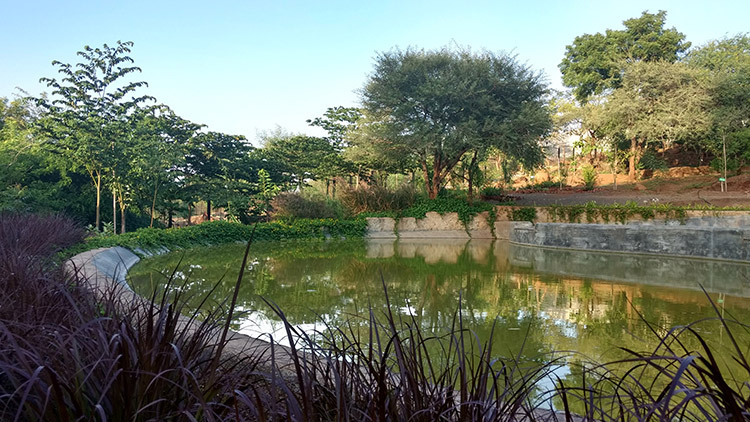 Care was taken to include shrubs and grasses that arrested soil erosion, gave a seasonal variation, were host plants for butterflies and were bird attracting. The project is a demonstrative example of the will of citizens. 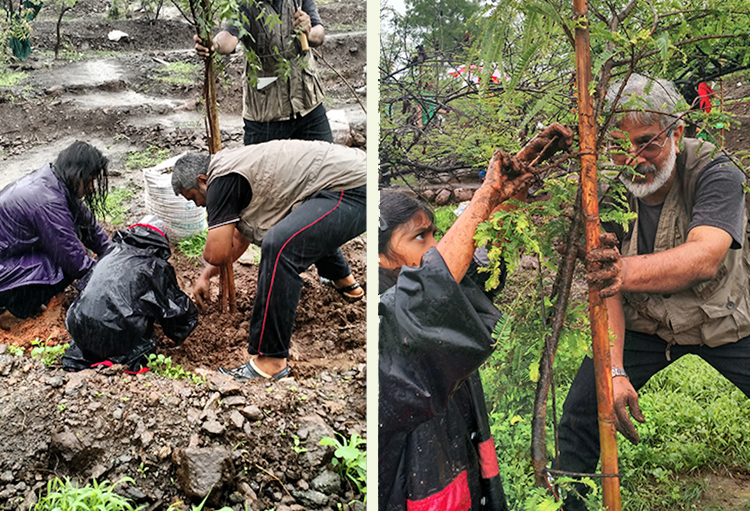 Citizens were called upon to do the planting on site and the response was overwhelming. It is a brilliant initiative which teaches by example that the onus is on us- Be the change you want to see !